Diagenode offers a variety of end-to-end systems to streamline DNA methylation and chromatin immunoprecipitation workflows. 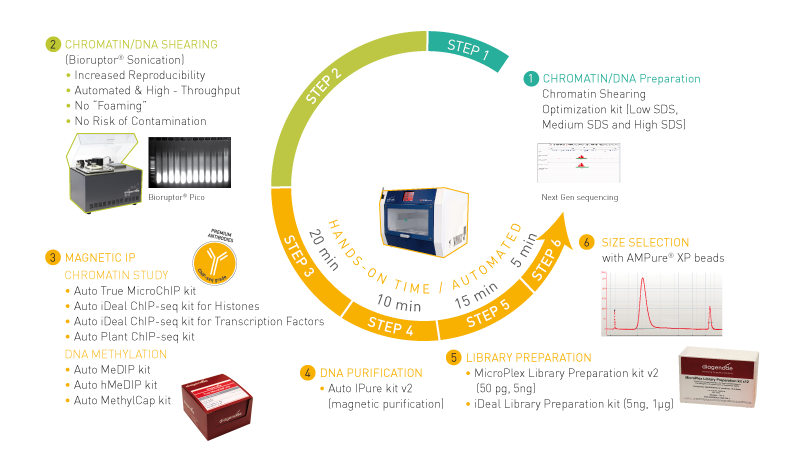 Diagenode’s IP-Star® Compact is a simple, automated bench-top instrument that standardizes different epigenetics applications (i.e. ChIP, MeDIP or NGS Library preparation) and library preparation. The platform offers full workflow support for epigenetics research, utilizing our complete kits and laboratory-validated protocols to rapidly deliver high-quality and consistent data. Neonatal screening cards provide a valuable bio-bank for retrospective studies. We have used the Bioruptor Pico and IP-Star Compact instrument along with the Auto MeDIP and IPure v2 kit to generate genome-wide DNA methylation profiles using only minute DNA inputs. Using the Diagenode instruments and products has generated reproducible results and saved us hands-on time. We are satisfied with the level of service and technical support and would recommend Diagenode to all others working in the field of epigenetics.